Montjuic Cable Car Tickets Barcelona • Amazing views en route to the Castle! Montjuic is Barcelona’s beautiful forested coastal mountain and home to many of the city’s best treasures, such as the castle, the Olympic Stadium, botanical gardens, the Joan Miro Foundation and many more. The Montjuic Cable Car is a modern teleferic that takes you up the final ascent of the hill in a comfortable 8-seater cabin towards Barcelona’s castle. In total the journey takes you on a 270 feet (84.5 meters) climb along a 2,460-foot (750-meter) cable route, during which you’ll enjoy sensational panoramic views over Barcelona, and appreciate the beauty of its coastal location, wedged between the shimmering Mediterranean sea and the verdant Collserola mountain range. It’s definitely the best way to arrive at the castle, and beats a steep sweaty walk any day. Don’t however get the Montjuic Cable Car confused with the Port Cable Car (aka Teleferico del Puerto or Aeri del Port) which is an aerial tram found in Barcelona’s old port. Nor confuse it with the Montjuic Funicular, which we will talk about a bit as well on this page, as it links the metro system with the cable car and is probably the easiest way to arrive here. The cable car has three stops. The lowest stop is called the Parc Montjuic Stop and where you want to get on (check the map on this page for directions). From there you ascend above the trees to the Castell Stop, where you get off to check out Barcelona’s Castle. This hilltop fortress has a fascinating – and rather dark history (plus more great views!). On the way back you can stop off at the Mirador Stop, for even more views, or continue all the way back down to the Parc Montjuic Stop, from where you are well poised to explore the rest of Montjuic’s great attractions, starting with Joan Miro’s arresting museum. You can find a PDF of the route here. The Montjuic Funicular will help you ascend the first part of the mountain and get you to the Parc Montjuic Stop, where you can board the cable car all the way up to the castle. This small funicular is essentially an extension of Barcelona’s excellent metro system, and you get it by alighting at Parallel metro station (on both the green and purple line) and then following the signs. The train shuttles up and down the lower part of the hillside (in a tunnel, so no views unfortunately) and drops you off in just the right place to get on board the cable car. If you’ve bought tickets for the tourist bus, you can ride the bus’ red route to the Parc Montjuic Stop (the cable car’s starting point). In fact the tourist bus is a pretty good option in general for exploring Montjuic as its a pretty big hill, with a fair distance between some of the attractions, and the tourist bus can ferry between them. You can buy hop on / hop off tickets here. You will still need tickets for the cable car, as the bus doesn’t go all the way to the top of the hill. 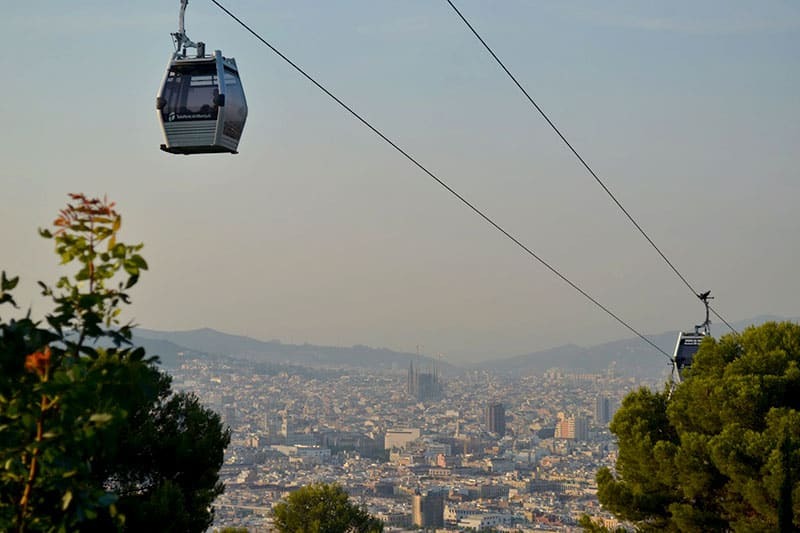 You can reserve your Montjuic Cable Car tickets online via trusted travel site Get Your Guide. Select the day you want, and you can board any time on the day. Just turn up to the office at the Parc Montjuic Stop (Av. Miramar 30) with the ticket voucher, which you can either print or bring on your phone. The cable car’s operational hours change depending on the season. How long does the cable car take? The ride itself takes about 5 minutes to reach the top, with carriages calling by the stops every few minutes. During peak season you might have to queue a little to get on board. How much does the cable car cost? In 2019, a return ticket costs €12.70. How much does the funicular cost? The funicular that connects the metro to the cable car costs the same as a metro journey (€2.20), but if you come directly from the metro it is a free extension of your journey (you do not need a separate ticket). What is there to do on Montjuic? Lots! The cable car takes you to the castle, but after you descend again you are nearby the Joan Miro Foundation, the Botanical Gardens, The Olympic Stadium, the Piscina Municipal de Montjuic (if you fancy a swim in a stunning environs), the National Museum of Catalan Art, Poble Espanyol, the Magic Fountain and more. For a complete list of things to do on Monjuic head to our article. Which cable car is better? Barcelona has two cable cars, one servicing Montjuic the other servicing the Port Vell, known as the Teleferic del Puerto. The Montjuic Cable Car is more modern and offers better views, with shorter times between cars, and also has better reviews on platforms such as Tripadvisor and Google. The Port Cable Car however does last longer (around 7 minutes) and has a certain nostalgic charm (it opened in 1931).